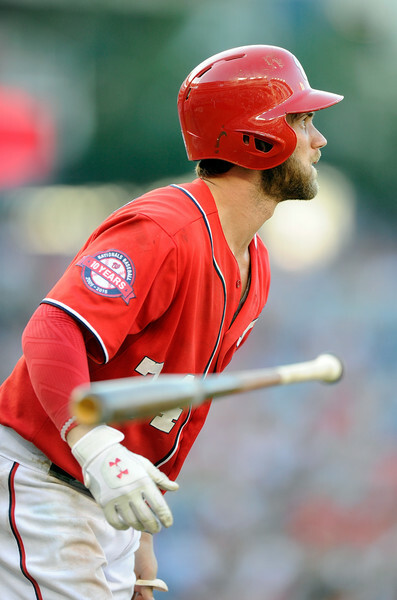 Bryce Harper homered off of a bad man on Saturday afternoon at Nationals Park. It looks like he caught a 93-MPH two-seam fastball tailing over too much of the outer half of the plate, and he deposited it violently off a seat in the right field upper deck. It was his 27th home run of the season. He’s been homering at a regular pace, but it’s been a bit since he’s hit a moonshot like this. Clayton Kershaw took the mound for this 4-2 Dodgers win, and it was just one of those incredible days for the Koufax of our era. He had 14 strikeouts in eight shutout innings, getting Harper to go down on strikes three times. By the time the Dodgers brought Kenley Jansen in to mop up the ninth, a ferocious right-handed closer like him probably seemed pretty human to a mutant like Harper.